Note that the first planet's mean angular velocity is slightly modified in the presence of the second planet, but that its major radius remains the same. The second planet's mean angular velocity is also slightly modified in the presence of the first planet, but its major radius remains the same. At this stage, we have effectively reduced the problem of determining the secular evolution of the planetary orbits to a pair of matrix eigenvalue equations (Gradshteyn and Ryzhik 1980c) that can be solved via standard numerical techniques (Press et al. 1992). Once we have determined the eigenfrequencies, and , and the corresponding eigenvectors, and , we can find the phase angles and by demanding that, at , Equations (10.71)-(10.74) lead to the values of , , , and given in Table 4.1. Table 10.1: Eigenfrequencies and phase angles obtained from Laplace-Lagrange secular evolution theory. The theory outlined here is generally referred to as Laplace-Lagrange secular evolution theory. The eigenfrequencies, eigenvectors, and phase angles obtained from this theory are listed in Tables 10.1-10.3. Note that the largest eigenfrequency is of magnitude arc seconds per year, which translates to an oscillation period of about years. In other words, the typical timescale over which the secular evolution of the solar system predicted by Laplace-Lagrange theory takes place is at least years, and is, therefore, much longer than the orbital period of any planet. Figure: The full circles show the observed planetary perihelion precession rates (left-hand panel) and ascending node precession rates (right-hand panel) at J2000. All ascending nodes are measured relative to the mean ecliptic at J2000. The empty circles show the theoretical precession rates calculated from Laplace-Lagrange secular evolution theory. Source (for observational data): Standish and Williams (1992). Figure 10.2 compares the observed perihelion and ascending node precession rates of the planets at (which corresponds to the epoch J2000) with those calculated from the theory described previously. It can be seen that, generally, there is good agreement between the theoretical and observed precession rates, which gives us some degree of confidence in the theory. On the whole, the degree of agreement exhibited in the left-hand panel of Figure 10.2 is better than that exhibited in Figure 5.1, indicating that the Laplace-Lagrange secular evolution theory described in this chapter is an improvement on the (highly simplified) Gaussian secular evolution theory outlined in Section 5.4.
for . Because and , it follows that all of the planetary orbits would lie in the same plane, and this plane--which is, of course, the invariable plane--is inclined at to the ecliptic plane. Furthermore, the longitude of the ascending node of the invariable plane, with respect to the ecliptic plane, is . Actually, it is generally more convenient to measure the inclinations of the planetary orbits with respect to the invariable plane, rather than the ecliptic plane, because the inclination of the latter plane varies in time. We can achieve this goal by simply omitting the fifth inclination eigenstate when calculating orbital inclinations from Equations (10.73) and (10.74). Table: Components of eccentricity eigenvectors obtained from Laplace-Lagrange secular evolution theory. All components multiplied by . Moreover, on average, the th planet's perihelion point precesses at the associated eigenfrequency, . The precession is prograde (i.e., in the same direction as the orbital motion) if the frequency is positive, and retrograde (i.e., in the opposite direction) if the frequency is negative. If the Lagrange condition is not satisfied then all we can say is that the maximum eccentricity is given by Equation (10.81), and there is no minimum eccentricity (i.e., the eccentricity can vary all the way down to zero). Furthermore, no mean precession rate of the perihelion point can be identified. It can be seen from Table 10.2 that the Lagrange condition for the orbital eccentricities is satisfied for all planets except for Venus and Earth. The maximum and minimum eccentricities, and mean perihelion precession rates, of the planets (when they exist) are given in Table 10.4. Note that Jupiter and Uranus have the same mean perihelion precession rates, and that all planets that possess mean precession rates exhibit prograde precession. Table: Components of inclination eigenvectors obtained from Laplace-Lagrange secular evolution theory. All components multiplied by . Moreover, on average, the ascending node precesses at the associated eigenfrequency, . The precession is prograde (i.e., in the same direction as the orbital motion) if the frequency is positive, and retrograde (i.e., in the opposite direction) if the frequency is negative. If the Lagrange condition is not satisfied then all we can say is that the maximum inclination is given by Equation (10.84), and there is no minimum inclination (i.e., the inclination can vary all the way down to zero). Furthermore, no mean precession rate of the ascending node can be identified. It can be seen from Table 10.3 that the Lagrange condition for the orbital inclinations is satisfied for all planets except for Venus, Earth, and Mars. The maximum and minimum inclinations, and mean nodal precession rates, of the planets (when they exist) are given in Table 10.4. The four outer planets, which possess most of the mass of the solar system, all have orbits whose inclinations to the invariable plane remain small. On the other hand, the four relatively light inner planets have orbits whose inclinations to the invariable plane can become relatively large. Observe that Jupiter and Saturn have the same mean nodal precession rates, and that all planets that possess mean precession rates exhibit retrograde precession. Table 10.4: Maximum/minimum eccentricities and inclinations of planetary orbits, and mean perihelion/nodal precession rates, from Laplace-Lagrange secular evolution theory. All inclinations relative to invariable plane. 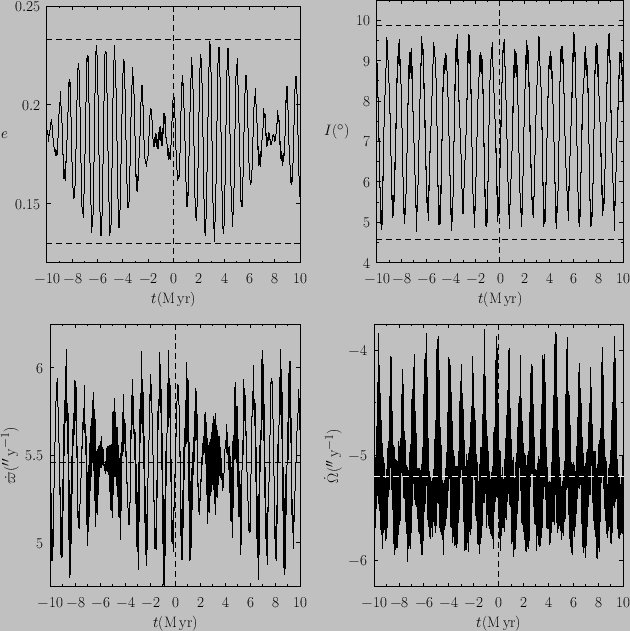 Figure 10.3: Time variation of the eccentricity (top left), inclination (top right), perihelion precession rate (bottom left), and ascending node precession rate (bottom right), of Mercury, as predicted by Laplace-Lagrange secular perturbation theory. Time is measured in millions of years relative to J2000. All inclinations are relative to the invariable plane. The horizontal dashed lines in the top panels indicate the predicted minimum and maximum eccentricities and inclinations from Table 10.4. The horizontal dashed lines in the bottom panels indicate the predicted mean perihelion and ascending node precession rates from same table. 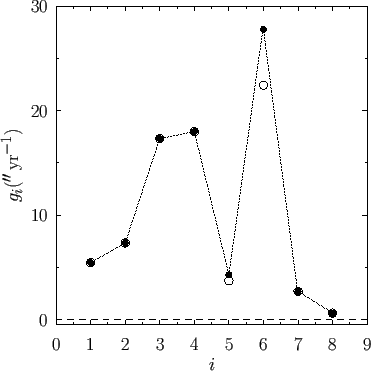 Figure 10.3 shows the time variation of the eccentricity, inclination, perihelion precession rate, and ascending node precession rate, of Mercury, as predicted by the Laplace-Lagrange secular perturbation theory described earlier. It can be seen that the eccentricity and inclination do indeed oscillate between the upper and lower bounds specified in Table 10.4. Moreover, the perihelion and ascending node precession rates do appear to oscillate about the mean values ( and , respectively) specified in the same table. Figure 10.4: The eccentricity eigenfrequencies obtained from Brouwer and van Woerkom's refinement of standard Laplace-Lagrange secular evolution theory (filled circles), compared with the corresponding eigenfrequencies from Table 10.1 (open circles). According to Laplace-Lagrange secular perturbation theory, the mutual gravitational interactions between the various planets in the solar system cause their orbital eccentricities and inclinations to oscillate between fixed bounds on timescales that are long compared to their orbital periods. Recall, however, that these results depend on a great many approximations; the neglect of all nonsecular terms in the planetary disturbing functions, as well as the neglect of secular terms beyond first order in the planetary masses, and beyond second order in the orbital eccentricities and inclinations. It turns out that, when the neglected terms are included in the analysis, the largest correction to standard Laplace-Lagrange theory is a second-order (in the planetary masses) effect caused by periodic terms in the disturbing functions of Jupiter and Saturn that oscillate on a relatively long timescale (i.e., almost 900 years), due to the fact that the orbital periods of these two planets are almost commensurable (i.e., five times the orbital period of Jupiter is almost equal to two times the orbital period of Saturn). In 1950, Brouwer and van Woerkom worked out a modified version of Laplace-Lagrange secular perturbation theory that takes the aforementioned correction into account (Brouwer and van Woerkom 1950). This refined secular evolution theory is described, in detail, in Murray and Dermott (1999). As is illustrated in Figure 10.4, the values of the eccentricity eigenfrequencies and in the Brouwer-van Woerkom theory differ somewhat from those specified in Table 10.1. The corresponding eigenvectors are also somewhat modified. The Brouwer-van Woerkom theory contains two additional, relatively small-amplitude, eccentricity eigenmodes that oscillate at the eigenfrequencies and . On the other hand, the Brouwer-van Woerkom theory does not give rise to any significant modifications to the inclination eigenmodes. Figure 10.5 shows the maximum and minimum orbital eccentricities predicted by the Brouwer-van Woerkom theory, compared with the corresponding limits from Table 10.4. It can be seen that the refinements introduced by Brouwer and van Woerkom modify the oscillation limits for the orbital eccentricities of Mercury and Uranus somewhat, but do not significantly change the limits for the other planets. 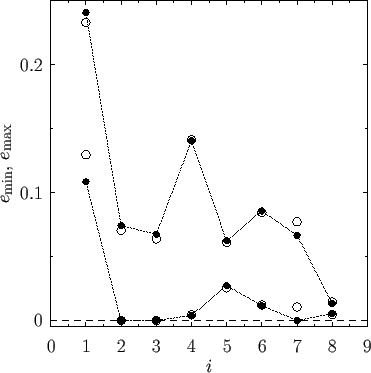 Of course, the oscillation limits for the orbital inclinations are unaffected by these refinements (because the inclination eigenmodes are unaffected). Figure 10.5: The maximum and minimum orbital eccentricities predicted by Brouwer and van Woerkom's refinement of standard Laplace-Lagrange secular evolution theory (filled circles), compared with the corresponding limits from Table 10.4 (open circles). It must be emphasized that the Brouwer-van Woerkom secular evolution theory is only approximate in nature. In fact, the theory is capable of predicting the secular evolution of the solar system with reasonable accuracy up to a million or so years into the future or the past. However, over longer timescales, it becomes inaccurate because the true long-term dynamics of the solar system contains chaotic elements. These elements originate from two secular resonances among the planet: , which is related to the gravitational interaction of Mars and the Earth; and , which is related to the interaction of Mercury, Venus, and Jupiter (Laskar 1990).